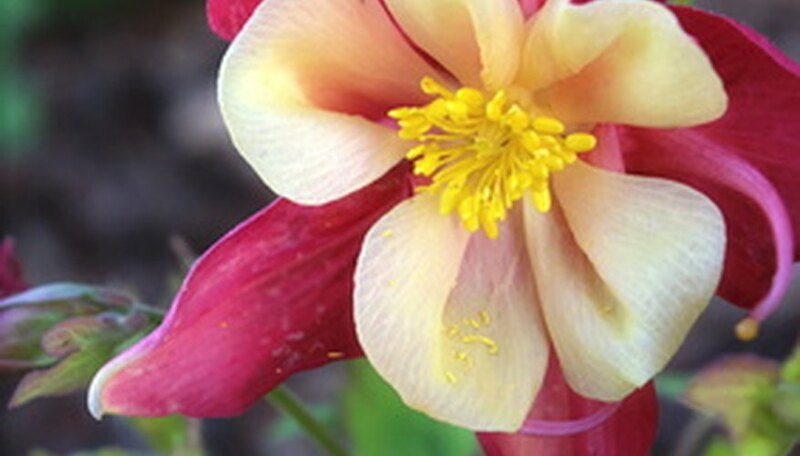 Columbines (Aquilegia) are old-fashioned perennial flowers with delicate star-shaped blooms in pale shades of red, purple, yellow, pink and white atop sturdy, slender stems surrounded by lacy foliage. Hummingbirds love the blooms, and songbirds enjoy the seed pods left behind in autumn. If your columbine outgrows its bed, if you're moving and want to take some columbine along to your new home, or if you're just rearranging your flower beds, the plants can be moved. Transplant columbine in early spring so the roots can become established in their new home before the hot days of summer. Plant columbine on a cool, overcast day. If possible, transplant columbine when rain is in the forecast. A stretch of cool days will give the roots a chance to settle in. Plant in a spot where the soil drains well. Columbine can be planted in full sunlight or partial shade. Columbine does well where it will be exposed to morning sunlight, but in shade during the hottest part of the day. Dig the clump of columbine with a spade. Insert the spade deep into the soil a few inches from the plant so you don't cut into the roots. Rock the spade back and forth to loosen the roots, then continue around the plant. Once you've worked around the diameter of the plant, lift the plant carefully from the soil. Try to get as much of the roots as possible, as columbine has long roots. Keep as much of the soil intact as possible. Place the columbine plant on a piece of cardboard or a plastic tarp to make the plant easier to move. If you won't be transplanting immediately, wrap the roots in damp burlap first, and keep the plant in a cool area until you can get it in the ground. Dig a hole only as deep as the columbine plant, and at least twice as wide. Place the plant in the hole. Be sure the crown of the columbine plant, which is where the roots meet the stems, is slightly above ground level. and fill it 2/3 full with reserved soil. Fill the hole with water, and allow it to drain, then finish filling the hole with soil. Till the hole 2/3 full with reserved soil. Fill the hole with water, and allow it to drain, then finish filling the hole with soil. Fertilize the columbine plant immediately after planting, using a water soluble fertilizer for blooming plants. Read the label for exact specifications. Spread 2 to 3 inches of mulch such as small bark chips or pine needles around the base of the plant. Mulch will keep the soil cool, and will retain moisture. Columbine can be transplanted in autumn, after the hot days of summer have passed.